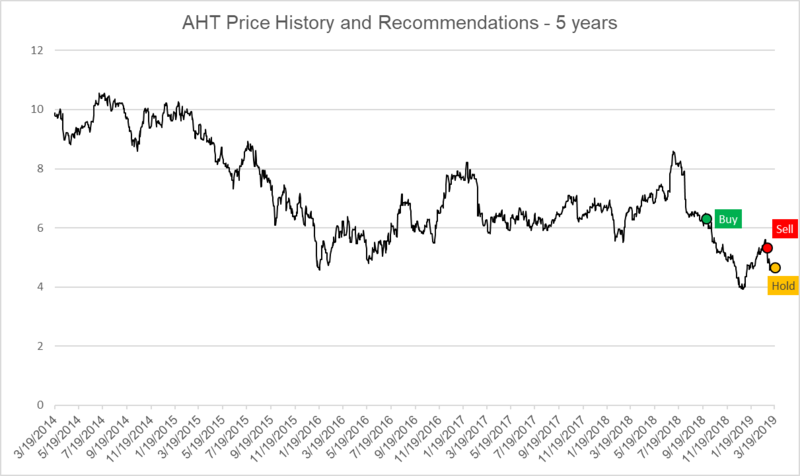 AHT has the highest insider ownership of lodging REITs, so their external management is less worrisome than it should be. After declining to $4, the stock has recovered to the $4.80 range, but further upside catalysts are unclear. With a 10% dividend yield, it might be worth for some investors to wait, but we're staying on the sidelines for now. Ashford Hospitality Trust (AHT) is a Real Estate Investment Trust listed on the NYSE that invests opportunistically in the hospitality industry in upper upscale, full service hotels, and at all levels of the capital structure, primarily within the United States. As of 3/07/2019, Ashford's stock price was $4.58 with a market capitalization of $560.7MM. Ashford owns 119 hotels with a total of 25,087 rooms. Ashford operates in the hospitality subsector of REITs. Hospitality REITs focus on investing in and owning properties ranging from budget motels to ultra-luxurious travel destinations. What makes investing in hotels unique when compared to other types of commercial real estate is the extremely short-term nature of their "lease" structure. Unlike other types of commercial properties, hotels can adjust their rental rates daily, which is great during inflationary environments. DiamondRock Hospitality Company (DRH) - DRH is a self-advised REIT that is an owner of a leading portfolio of geographically diversified hotels concentrated in top gateway markets and destination resort locations with a market capitalization of $2.17B. 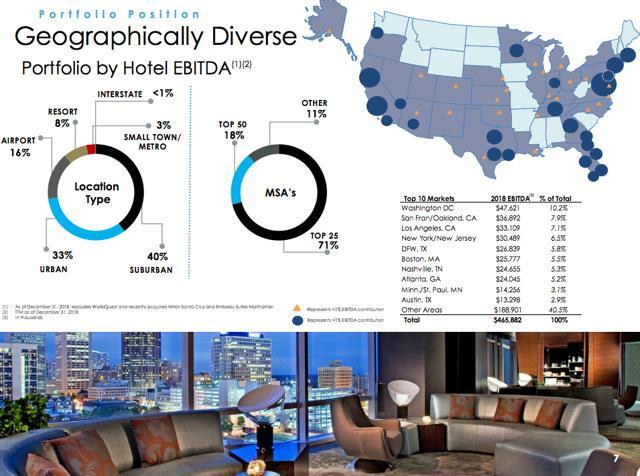 DHR has strategically positioned its hotels to be operated both under leading global brand families such as Hilton (NYSE:HLT) and Marriott (NASDAQ:MAR) as well as unique boutique hotels in the lifestyle segment. DHR owns 30 premium quality hotels with over 9,900 rooms. Host Hotels & Resorts, Inc. (HST) - HST is an S&P 500 company and is the largest lodging REIT and one of the largest owners of luxury and upper-upscale hotels with a market capitalization of $14.34B. Guided by a disciplined approach to capital allocation and aggressive asset management, the company partners with premium brands such as Marriott, Ritz-Carlton, Westin, Sheraton, W, St. Regis, The Luxury Collection, Hyatt, Fairmont, Hilton, Swissotel, ibis, and Novotel in over 50 major markets. HST currently owns 88 properties in the United States and five properties internationally totaling approximately 52,000 rooms. Park Hotels & Resorts Inc. (PK) - PK is the second largest publicly traded lodging REIT with a diverse portfolio of market-leading hotels and resorts with significant underlying real estate value. PK's portfolio consists of 52 premium-branded hotels and resorts with over 30,000 rooms, a substantial portion of which are located in prime United States markets with high barriers to entry. PK's market capitalization is $6.32B. Pebblebrook Hotel Trust (PEB) - PEB is a publicly traded REIT organized to opportunistically acquire and invest primarily in upper upscale, full-service hotels located in urban markets in major gateway cities. PEB owns 64 hotels, totaling approximately 15,400 guest rooms, located in 11 states and the District of Columbia. PEB market capitalization is $4.2B. Xenia Hotels & Resorts, Inc. (XHR) - XHR is a self-advised and self-administered REIT that invests primarily in premium full service and lifestyle hotels, with a focus on the top 25 U.S. lodging markets as well as key leisure destinations in the United States. XHR owns 40 hotels comprising of 11,239 rooms, across 17 states and the District of Columbia. XHR's market capitalization is $2.23B. 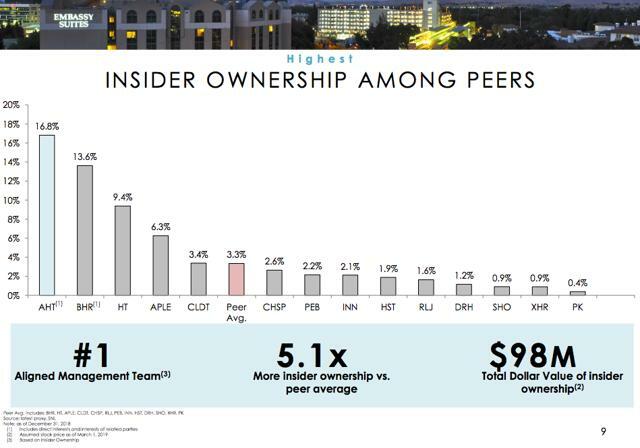 As shown below, when comparing inside ownership to peers, Ashford has the most aligned management team with 16.8% in internal ownership. This equates to 5.1x more than peer average with $98MM owned. Ashford's concentration of internal ownership shows that the company's managers are highly invested in the future performance of Ashford and that investors and management have aligned incentives. Additionally, Ashford has affiliated companies intended to drive performance, guest satisfaction, and revenue. Ashford has created a platform that is intended to maximize outperformance and give the company a strategic competitive advantage over peers. As a result of the aforementioned competitive advantages, Ashford has had 5 years of cumulative EBITDA growth outperformance when compared to industry peers, with EBITDA growth of 30% and 27% in 2017 and 2018, respectively. 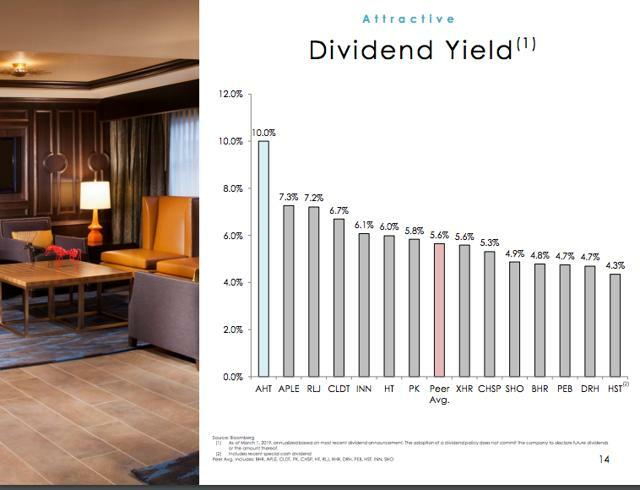 Additionally, as shown below, Ashford boasts a very attractive dividend yield of 10.0% (as of March 1, 2019). The peer average is 5.6%. 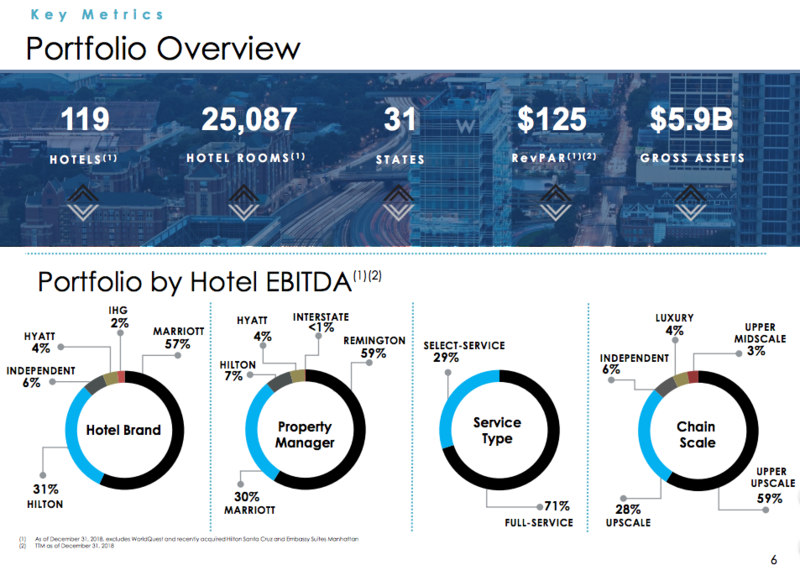 In addition to owning a diverse set of brands, Ashford has invested in a geographically diverse set of hotels with the highest concentration in Washington DC, which accounts for 10.2% of the company's 2018 EBITDA. 71% of Ashford's hotels are located in the top 25 MSAs, while 18% are in the top 50, and the remaining 11% outside of that. Looking at 2018, Ashford reported FY18 revenue of $1.43B, representing a decline from FY17 and FY16 revenues of $1.44B and $1.49B, respectively. This represented the second year in a row of revenue declines for Ashford. Ashford attributes the decline primarily to the strategic disposition of properties over the last two years. In 2017 and 2018, the company sold 6 hotels, while only acquiring two during that same period. 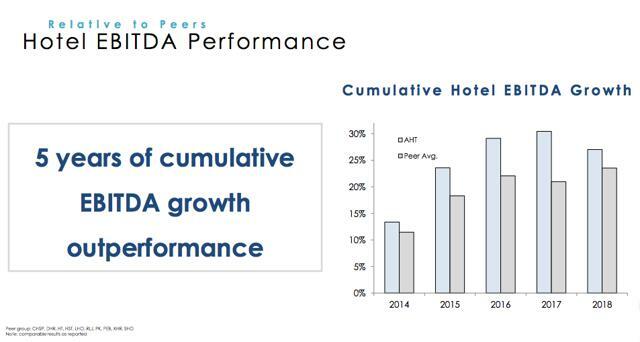 As shown below, room and food and beverage revenue has declined since 2018, all due to the disposition of hotels. It should be noted that other revenue consists mainly of internet access, parking, spa, and business interruption revenue. Ashford's other revenue has increased over the last two years primarily due to interruption revenue related to the BP Deepwater Horizon oil spill in the Gulf of Mexico in 2010 and business interruption revenue from Hurricane Irma. Ashford reported FY18 revenue per available room ("RevPAR") of $124.19, which represents a 1.0% increase over FY17 RevPAR of $122.98. Additionally, Ashford reported its average occupancy for 2018 as 76.40%, a slight decline from its 2017 average occupancy of 77.42%. Ashford's FY18 average daily rate ("ADR") was $162.55, an increase from FY17's ADR of $160.46. As a reminder, RevPAR is a commonly used measure within the hotel industry to evaluate hotel operations. RevPAR is defined as the product of the ADR charged and the average daily occupancy achieved. RevPAR does not include revenues from food and beverage or parking, telephone, or other guest services generated by the property. 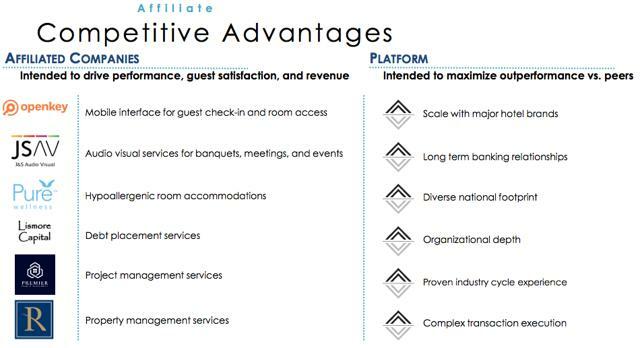 Although RevPAR does not include these ancillary revenues, it is generally considered the leading indicator of core revenues for many hotels. Ashford also uses RevPAR to compare the results of hotels between periods and to analyze results of comparable hotels (comparable hotels represent hotels that Ashford has owned for the entire year). Ashford reported a decrease in operating expenses to $900.6MM during 2018, representing a 0.7% decrease from 2017. The decline in operating expenses is primarily the result of the disposition of properties during 2018. It should be noted that due to Ashford being externally managed by Ashford, Inc. (AINC), Ashford incurs an annual advisory service fee. This fee can be considered discretionary, and given the high level of management ownership, it could be assumed that the fee would be decreased during a downside scenario - although that may not necessarily occur. In 2018, Ashford's advisory fee increased $15.9MM or 29.9%, to $69.1MM, when compared to 2017. In 2018, the advisory service fee was comprised of a base advisory fee of $35.5MM, equity-based compensation of $25.2MM associated with equity grants of common stock and LTIP units awarded to the officers and employees of Ashford Inc. and reimbursable expense of $8.4MM. Note, the company reported impairment charges of $23.4MM in 2018, representing a $13.2MM increase from 2017 impairment charges of $10.2MM. The 2018 impairment charges included a $9.9MM impairment charge for the San Antonio Marriott, a $6.7MM impairment charges for the Annapolis Crowne Plaza, a $5.1MM impairment charge for the Wisconsin Dells Hilton Garden Inn, and a $2MM impairment charge for the SpringHill Suites Centreville. The increase in impairment charges is an important note regarding the asset values of Ashford's portfolio. Net income (loss) attributable to common stockholders for 2018 was ($169.5MM), a decline of $47.0MM from 2017 net income of ($122.6MM). 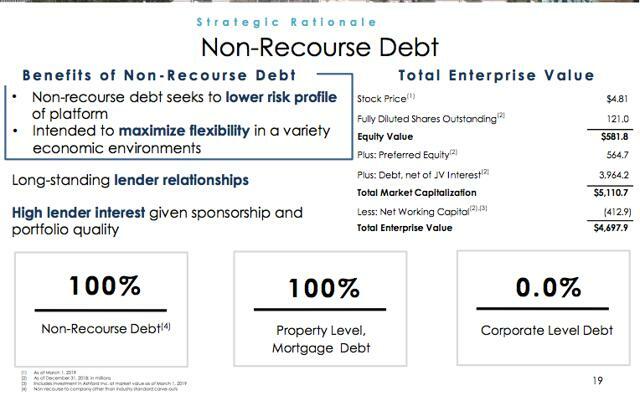 The decline in net income and continued net loss is the result of an increase in stock-based compensation related to the advisory fee, increased debt (resulting in higher borrowing costs), and higher impairment charges. Ashford reported EBITDA of $343.7MM for 2018, representing a 10% decline from 2017 EBITDA of $378.3MM. Additionally, Ashford reports EBITDAre, which adjusted for impairment charges on real estate and for gains or losses on the sale of hotel properties. Ashford reported its 2018 EBITDAre at $366.6MM, compared to $378.3MM for 2017. The decline in EBITDA and EBITDAre is primarily the result of an overall lower 2018 net income. It should be noted that Ashford also reports an Adjusted EBITDAre figure which includes various addback to EBITDAre. While Ashford is trying to report a more normalized figure that excludes various one-time and non-cash expenses, investors should not put much weight into this number, given the amount of addbacks Ashford is putting into this calculation. 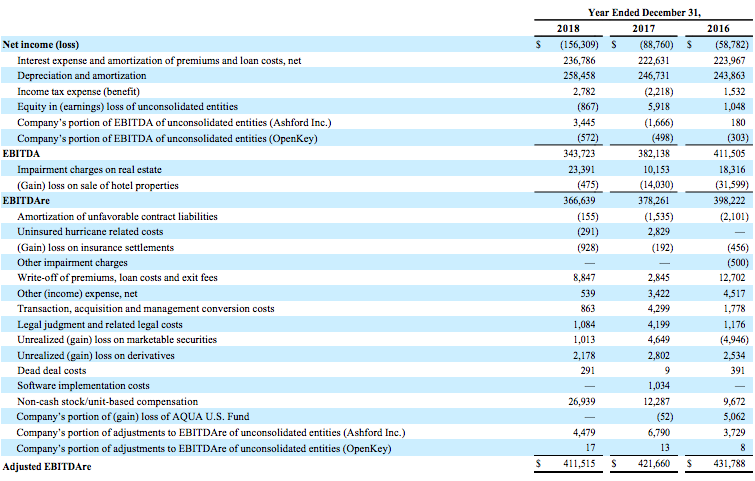 In addition to EBITDA, EBITDAre, and Adjusted EBITDAre, Ashford reports funds from operations ("FFO") and adjusted funds from operations ("AFFO"). FFO is a relative measure of an equity REIT to recognize that income-producing real estate has historically not depreciated on the basis determined by GAAP. Ashford reported 2018 FFO and AFFO of $82.4MM and $145.3MM, respectively, compared to 2017 FFO and AFFO of $98.4MM and $168.9MM, respectively. The decline in FFO and AFFO is primarily the result of portfolio dispositions. As of December 31, 2018, Ashford reported $3.97B in total debt consisting of $347.4MM in fixed rate debt and $3.6B in floating rate debt. 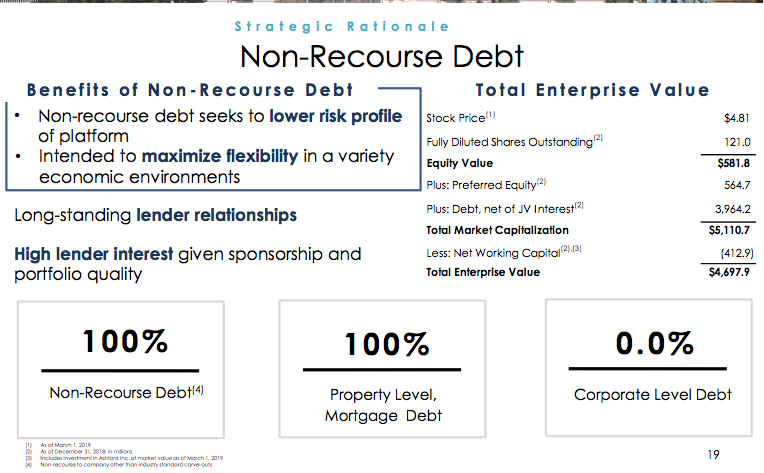 As of 12/31/2018, 100% of Ashford's debt was non-recourse, property-level mortgage debt with 0% of the $3.97B at the corporate level. Below shows a breakout of Ashford's outstanding mortgages as of 12/31/2018. Ashford's $3.97B in debt carries a weighted average interest rate of 5.75%, with an average EBITDA debt yield of 11.7%. 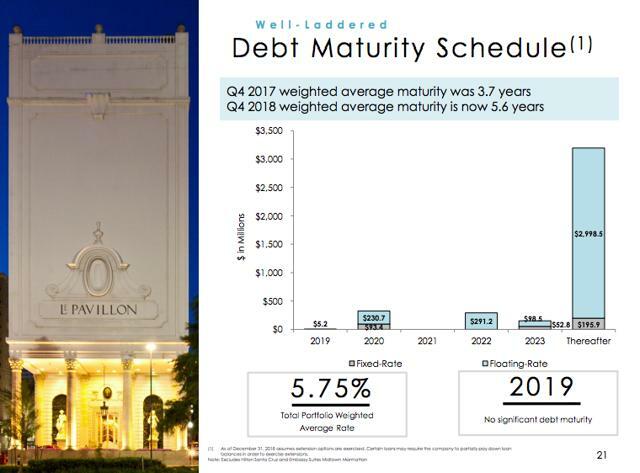 Looking at Ashford's debt maturities, the company's 4Q2018 weighted average maturity was 5.6 years, representing an improvement from its 4Q2017 weighted average maturity of 3.7 years. Ashford has been able to achieve extended maturities through strategic refinancings. 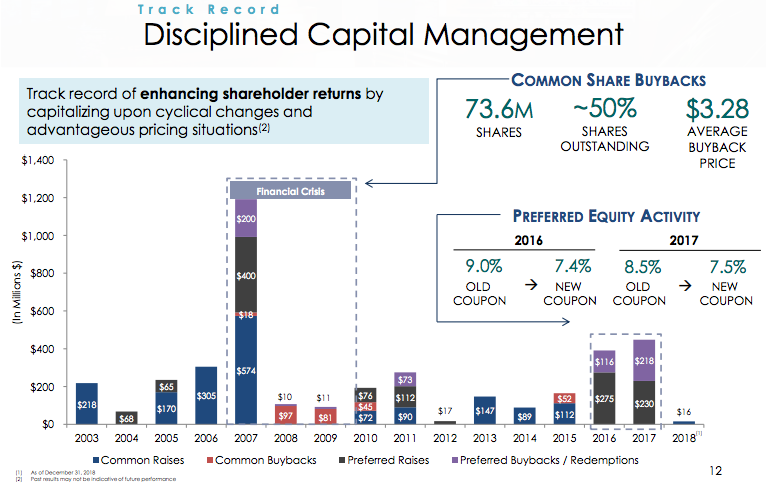 Ashford has maintained disciplined capital management by taking advantage of cyclical changes and advantageous pricing situations. In 2018, Ashford raised only $16MM in common stock. This is compared to $230MM in preferred stock raises and $218MM in preferred buybacks/redemptions. Ashford paid a total of $97.4MM in dividends during 2018, $42.6MM of which were preferred dividends. In 2019, Ashford expects to pay a quarterly dividend of $0.12 per share of common stock, representing an annualized dividend of $0.48 per common share. It should be noted that Ashford's dividend has not increased since 2013. 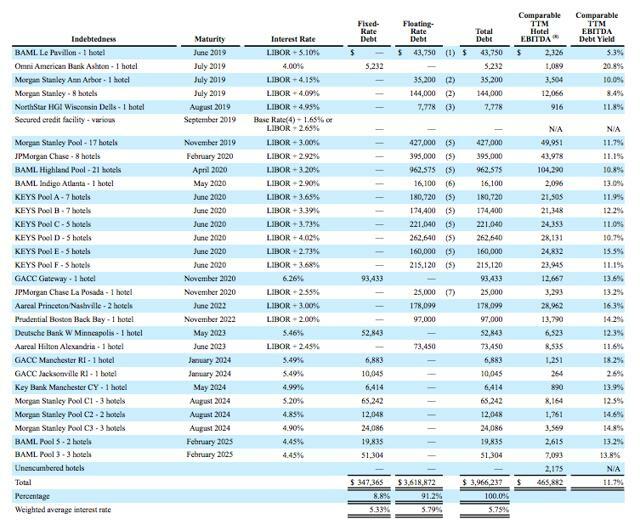 As of 3/18/2019, Ashford's dividend yield was 10.17%. Looking at Ashford's relative valuation, the company has a favorable cap rate of 8.4%, compared to a peer average of 7.2%. 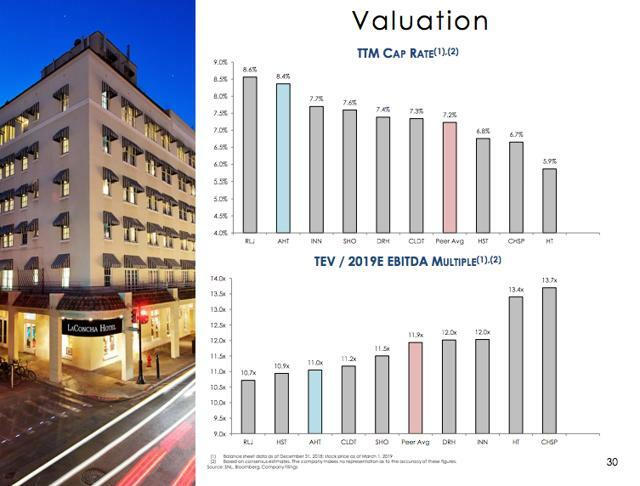 Additionally, Ashford is currently trading at a TEV/2019E EBITDA multiple of 11.0x, whereas its peer average is 11.9x. We are really torn on AHT. In late 2018, we bought more when the stock pulled back but then sold out of it in favor of Host Hotels earlier this month. So far, we've been wrong on the stock price. Once we added to our position, the stock continued to decline through the end of 2018. We then swapped it for HST in February after it recovered slightly. Since then, the stock has declined even more. 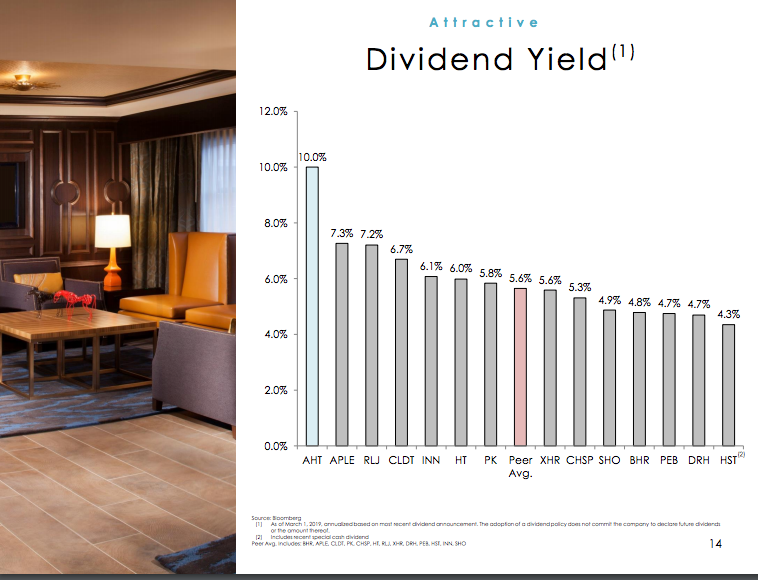 We LOVE the 10% dividend yield and its low payout ratio, but it hasn't been able to allocate capital fast enough in order to grow AFFO. It hit a peak AFFO of $1.51 in 2016 and is expected to reach $1.29 in 2019. It's not until 2021 when analysts expect AFFO to reach $1.54 that the company will surpass its previous high. We do think the stock could surprise to the upside and reach $7 plus if things go well and the market buys the story. Right now, there seems to be some doubt. At a price of $4.80, the stock trades at just 3.8 times AFFO, and it just seems too cheap to ignore. Despite the temptation, however, we are going to Hold off on this one until further notice but will be keeping a close eye on any catalysts - tangible or intangible - that would boost the stock price. For investors looking for income, we couldn't argue with jumping in here - although keep in mind that Hotel REITs are very sensitive to economic growth. So, if you do jump in here - while that 10% dividend looks good - be mindful of drivers that can hurt revenues, drive down the stock price, and force a dividend cut. Tactical allocation strategies across all income-producing securities. Investment ideas in REITs, Preferreds, Baby Bonds, Dividend Growth Stocks, High Dividend Stocks, and MLPs, ETFs and Closed-End Funds. Disclosure: I am/we are long AHT. I wrote this article myself, and it expresses my own opinions. I am not receiving compensation for it (other than from Seeking Alpha). I have no business relationship with any company whose stock is mentioned in this article.